Mad Cow Theatre began in late 1997 as a simple 2 - show project between a group of actor/directors in a former blueprint studio in Maitland, Florida. Audiences and critics took notice and Mad Cow Theatre continued, featuring works of consistent quality and simplicity. After an initial 4 year period of renting space from such mainstay Central Florida organizations as Rollins College, The Orlando Shakespeare Theater and The Civic Theatres of Central Florida, Mad Cow is now celebrating its 17th Season in Downtown Orlando. Mad Cow has built collaborative relationships with other downtown businesses and has received two Golden Brick Awards for outstanding contribution to downtown life. 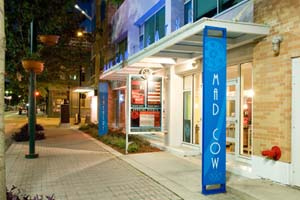 Mad Cow Theatre has also been named Best Theatre by Orlando Magazine for several years in a row. Mad Cow Theatre is one of Orlando's most respected professional theatre companies presenting compelling works of theatre for a wide-range of audiences. With a passion for both classic and contemporary plays representing the best of American and World literature, Mad Cow presented its 101st mainstage production with the start of the 2010 - 2011 season. Past seasons have included works by Chekhov (The Cherry Orchard), Fugard (Master Harold … and The Boys), Lanford Wilson (Burn This), Mamet (Speed The Plow, Glengarry Glen Ross), Tennessee Williams (The Glass Menagerie), Harold Pinter (Betrayal), Eric Overmyer (On The Verge), Beth Henley (Crimes of The Heart), Stephen Sondheim (Marry Me A Little, Company, Sweeney Todd), Eugene Ionesco (The Chairs), Moises Kaufman (The Laramie Project), George Bernard Shaw (Candida) and Tom Jones/Harvey Schmidt (The Fantasticks), Kenneth Lonergan (Lobby Hero) and Bertolt Brecht (The Life of Galileo). Mad Cow Theatre attracts the area's most talented and gifted actors, designers and directors. A mainstay of the company is its dedication to the process of creating theatre, incorporating in-depth rehearsal and research periods along with a nurturing collaborative process. The company has received numerous awards, including Arts Innovator of the Year and Collaborator of the Year by United Arts of Central Florida, several Umbrella Awards at The Orlando International Fringe Festival and Best Theatre Company from Orlando Magazine and The Orlando Weekly. For twelve years, Mad Cow Theatre has produced the Orlando Cabaret Festival, annually attracting the world’s finest cabaret talent to three weeks of lunchtime and evening shows, shows, and festivities in the heart of Downtown Orlando. The Cabaret Festival also features world-class local performers celebrating the best of the Great American Songbooks. Mad Cow’s intimate setting provides a cozy and elegant experience to experience these extraordinary performers. There’s a different lineup every night, where each evening of the Festival you can take in as many as three different and spectacular acts – a Cabaret-lover’s dream.